Students from Martin Luther King Jr. 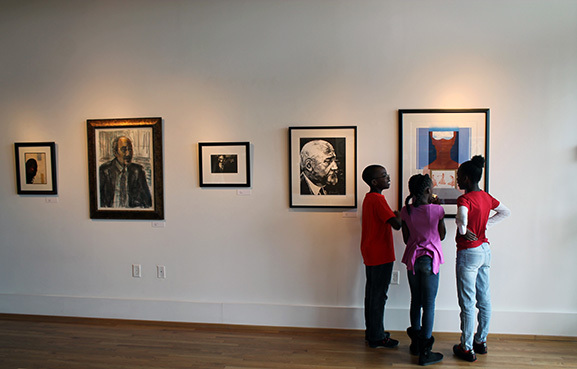 Elementary visited the Paul R. Jones Gallery on Oct. 8. From the October 2014 edition of Desktop News | Fifty art students from Martin Luther King Jr. Elementary School and Westlawn Middle School visited The University of Alabama’s Paul R. Jones Gallery of Art on Oct. 8 and 9 as part of the gallery’s inaugural K-12 Fellows program. There was a student-assisted ribbon-cutting at the door, during which Dean Robert Olin also announced the new value of the Paul R. Jones Collection of American Art, which was recently reappraised at $10.3 million. The students viewed a selection of works from the Paul R. Jones Collection of American Art that focuses on the theme of identity. The students will return to their classrooms to create their own works of art based on the theme, which will be displayed in the gallery in the late fall. “The University of Alabama has reached an important milestone in our stewardship of the Paul R. Jones Collection of American Art as we welcome students from Martin Luther King Jr. and Westlawn schools to the gallery,” Dean Olin said. Some 1,700 works of art in the collection valued at $4.8 million were donated to UA in 2008 by the late Paul Raymond Jones, a native of Bessemer and longtime resident of Atlanta. In 2013, more than 300 works from the Jones estate were added to the collection, bringing the total to approximately 2,000 works. The collection is now valued at $10.3 million. “The addition expands further what is already one of the country’s largest and most impressive collections of African-American art,” Olin said. Lucy Curzon, director of education and outreach for the Paul R. Jones Collection of American Art at The University of Alabama and associate professor of art history at UA, said the gallery is working to make the K-12 program available to more students in the future. She believes the program would make Jones proud. Curzon said she could not think of a better way to honor Jones and the collection than by enabling students to interact with it. “With the K-12 Fellows program, the art lives in the way he wanted it to live,” she said. “I like the concept of legacy, and this is about legacy – not only Paul’s legacy, but the new legacies we are creating. Abel Phillips, visual arts instructor at MLK Elementary, said he wanted his students to participate in the program because it will be a unique experience they will always remember.